The Rosguill peninsula in north Donegal is a very promising location for future dive trips because it has so much diving close by for both sports divers and ocean divers alike. So many sites in fact, that the only reason this guide hasn’t been split in two is that you can get to them all from Downings and Carrigart. To the left of the peninsula lies Sheephaven Bay with what we expect to be some superb diving between Horn Head and Melmore Head. A good deal of this would be suitable for sports divers only and it is a little weather dependent: the swell has precluded diving on both our trips here thusfar. However, there is an enormous cavern calling to be dived and local divers have talked of sunfish and basking sharks during the summer months. The great banes of divers venturing out in the winter months are cold, limited daylight and foul weather. To the right of the Rosguill peninsula lies the perfect winter diving spot: what starts as Mulroy Bay at the north-eastern tip of the peninsula snakes down through a series of narrows into Broad Water to the south and North Water to the east. Diving is possible in virtually any weather conditions, the sites are close to land (and slips) and there is diving for all grades. All three bays are almost worth a trip in their own right with fascinating estuarine underwater habitats and some interesting drop offs on the chart that beg to be explored. There is lots of diving for ocean divers here as well as some deep holes that might arouse the interest of the odd dive leader. Since the Downings Coastguard cottages can house loads of people and most of the diving is very close to slips you can run waves using dedicated coxswains and get two guaranteed dives each for a large group of people in limited daylight. In the extremely unlikely event that you can’t even get diving anywhere there’s still some beautiful scenery above water including the 180m Horn Head cliffs, Glenveagh National Park, the Atlantic drive around the Rosguill peninsula and many deserted sandy beaches. Mark Lee first organised a trip to the area in Easter 2006. He talked to Stephen Quinn from Lisburn SAC who has a house near Downings and also to John Joe Roland, chairman of Sheephaven Sub-Aqua Club. Both were really helpful but all the info they passed on has been included in this guide. Justine Cavanagh took a (crossover) trip here next in October 2008. You can launch from either the Mevagh Boat Yard slip, the slip at Downings or one at the Woodquarter picnic area 2 minutes south of Cranford. The Downings slip is suitable for Sheephaven Bay; Mevagh Boat Yard gives you access to Mulroy Bay and Melmore Head; the Woodquarter picninc area slip gives access to Broad Water Bay and North Water (Mevagh being suitable for the latter possibly as well). All three are usable at all stages of the tide and no more than ten or fifteen minutes from Carrigart. Make sure to launch promptly and avoid blocking the slips for too long. Mevagh Boat Yard has a private slip so it’s best to check with Dominic in the yard that it’s ok to use it before you travel up. Justine has a number for him. We’ve had no trouble using it, having asked on both occasions. Be careful near the end of the slip when launching boats. Parking is over in a patch of waste ground in the right close to a visible ship wreck. Parking areas are obvious in Downings and the picnic area at Woodquarter. The Downings slip had quite a lot of seaweed and watch the end of the slip at low tide or the boat could hop off. Stephen Quinn from Lisburn Sub-Aqua Club let Mark Lee use his moorings in Downings in Easter 2006 and Justine got moorings at the Mevagh Boat Yard next to the Swimming Rose, with the kind permission of Sammy Scott. Mark and Justine would have phone numbers for both if you were hoping to use the moorings again. The closest petrol station is just outside of Carrigart on the Cranford road. As mentioned in the overview section, if one is staying near Downings or Carrigart the sites can be rougly grouped into 4 areas: Sheephaven Bay, Mulroy Bay, Broad Water and North Water. Here’s a map of the Sheephaven and Mulroy Bay areas with dive sites. It isn’t drawn to scale! To dive in Sheephaven Bay you need to launch the boats from the slip at Downings: use UKHO Easytide Downings predictions for HW/LW and calculations on when to dive. 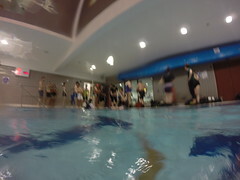 Slack is half an hour either side of HW/LW, and diving manageable an hour either side of HW/LW. Downings HW/LW is 10 minutes before Mulroy Bay bar. There is a 100m cavern west of Duncap Head. You will see a very large cavern above the surface: you could drive a double-decker bus into it. You can surface at any time during most of the penetration into the cavern. It takes around 10 minutes to get to the back of the cavern. There is a nice reef to the right as you come out of the cavern towards Duncap head about twenty to twenty-five metres deep. It’s about a 15 minute trip from Downings, 25 m max depth with a sandy bottom. The swell was too big to dive the cavern. We drove right up to it though and it’s really spectacular. Next time! There are two dives around Horn Head. There is good diving all around the east and northern side and in skate bay to the south. The bottom is sandy. This dive is sheltered from westerlies and diveable (with a slight drift) at any stage of the tide. We dived all around the eastern side of Horn Head. Several spots made very nice dives. The reef on the west side of Horn Head is also a nice dive. There is a sea arch on the west side of the head. There is a one to two knot current which makes a nice drift dive. Dive the western side on a flooding tide. The west side has a bottom of shells and gravel. Max depth on the site is about 30 metres and it’s about 20 minutes from Downings. This dive makes a nice second or bad weather dive. It is sheltered in easterlies. Be careful as this rock is sometimes submerged though it’s visible at low tide. It was too rough for us to dive this site in April 06. Suitable for ocean divers with a max depth of 20 metres. Sandy seabed, only 10 minutes from Downings slip. To find it, keep the coast on your right as you exit Downings and follow it around to Rinnaskeagh point. Head due west across first small bay and then at the headland follow a bearing of 305 ½ mile or approx 7 mins across Claddaghlahan Bay and the Wherryman Rock is just past the bay. Transect 2 = eastern headland of Claddaghlahan Bay with of Carrigart church. This makes a nice bright dive on outside of the rocks. Clearly visible from the surface it provides a shear rock face down to 25 meters on its western side. The eastern side of the rock provides for shallow diving with a maximum depth of 10 metres. It was too rough the day we tried to dive it. Only 10 minutes from Downings. Breagh Head is an exposed headland with wall dives all round but most sheltered on eastern side.There is a fine sandy bottom with dives on the west, north or eastern sides, weather-depending. We haven’t dived here yet. Other possible sites include Pat McGees, and Port Na Blagh arch and cave but exact locations would have to come from the local dive centres. 5 minutes north of Mevagh Boat Yard is a little inlet called Knox’s Hole. At the entrance, there is a deep section, between 20 to 25 metres deep. There are some great walls and lots in life. In particular this spot is teeming with dogfish, some of whom were spotted fighting with other by Podge! There can be quite strong eddies around this site so one’s movements can be unpredictable. Some divers swirled around the same point while others were spat up the channel. We also dived Crannoge Point to the south. The scenery wasn’t particularly remarkable but it does have the benefit of being close. Max depth would be 15 metres so diving it on slack times for the Narrows might make a gentle introduction for beginning divers. The Narrows is a stretch of water between Mevagh Boat Yard and Melmore Head only 10 minutes from Mevagh Boat Yard. The dive site is clearly marked with a beacon mounted on a rock in the middle of the channel. It is about 22 metres at its deepest and the bottom is mostly rock and kelp. It becomes quite shallow soon after passing the beacon. The Narrows is often billed as an exhilirating drift dive but my experience is that it is a marvellous dive on slack (ML). Slack seems mysterious in this region but we dived on slack 1.5hrs after Mulroy Bay bar LW. Diving on slack means you can appreciate the beatiful walls covered in sponges at your leisure, with little overhangs crammed with life: squat lobsters and bib, all sorts of crabs. Huge spider crabs man the walls carpeted in lovely sponges, especially elephant and yellow boring sponges.It’s also a fairly good drift dive on the eastern side of the rock. 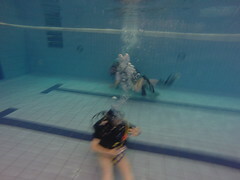 Drop to 15 – 18 meters and move out into the channel and let go. NB. Dive the Narrows on an incoming tide or one risks losing divers. Note to coxswains: drop divers in around 60 yards from rock and wait for divers about 3/4 of a mile up the bay. Using UKHO tides time for Mulroy Bay bar, we found that diving it at mid-tide, (3-4 hours after LW/before HW) on average spring tides gave a brisk drift dive which was lots of fun. If you drop divers in too far uptide of the beacon they can get swept around onto the leeward side which is shallower. Bring SMBs. Melmore Head is about 25-30 minutes from Mevagh Boat Yard. Like Horn Head, there are two dives around Melmore Head, one on the eastern side and one one the western side & northerly tip, both with a max depth of around 30 metres. On the eastern side there are large boulders, a sandy bottom, and lots of sea life. Dive the eastern side on an outgoing tide. The chart gives a 1.5kn ebbing current. This is the more sheltered dive of the two. 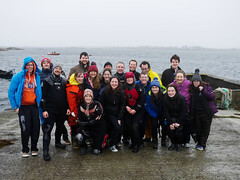 We dived the Eastern side a few hours after Mulroy Bay bar HW, as recommeded. There wasn’t a huge amount of tide (though plenty of swell). There was lots of life: sea hares, lobsters, shrimp, scorpion fish, congers and big wrasse. On the western, more exposed side, there are gullies and reefs running parallel with the land and a rocky bottom. Drop divers 100m west of the point. There is a 4m wide ravine at 26m. Move around head, keeping the wall on your right. There is a cave at 26m, with a bright blowhole at 15m and prawns inside. Dive the western side on an incoming tide. It is not possible to dive this site with northerly or westerly winds blowing and watch out for currents if you’re diving off-slack. The Limeburner Rock (chart coordinates 55° 18´ N 7° 48.11´ W) is a pinnacle from 4m down to 40m. It is supposed to be a spectacular dive but requires very calm weather. Here you will find large gullies and deep drop offs and prolific marine life: crayfish, lobsters, sunfish. It is usually very clear; however there can be a strong swell. The Limeburner rock lies approximately due north from Melmore Head. A yellow cardinal marker buoy lies to the north to keep ships away. Diving it at low water makes it easier to find; apparently it’s quite hard to find on a flat calm day. It is not tidal. We never got the chance to go out to this site. 6.5 nautical miles from Mevagh Boat Yard, leave 40 minutes to get there. Frenchman’s Rock / SV Gaelic / SS Kalliopi S.
Frenchman’s Rock (chart coordinates 55° 15.38´ N 7° 49.3´ W) is a sports diver dive west of Melmore Head. It can be reached from either Downings or Mevagh Boat Yard slips, about 30 minutes away from each. There are the remains of two wrecks on this rock. The visibility is usually good with plenty of fish life. The first wreck, the Gaelic, is very broken up (just some engine parts and plates lying around). The Calliope lies 20-25m inshore of the rock. It is quite scattered in 25m of water and a good place to see congers and the odd octopus. The rock is an excellent scenic dive in itself. It splits in two with a ravine. (The Gaelic’s in the ravine.) For a lovely dive do the following: dive on the east side and head north (not through the ravine). There is a nice wall at 35m. Turn around, head around northerly point, come south along the west side of the rock head through ravine. There are alcoves on the north of the wall. This dive needs slack. Slack is at Mulroy Bay bar HW/LW. Half an hour either side should be ok. It also needs a calm sea. It is not diveable if there is a large swell. Keep a boat each side of the rock. Coxswains, be very careful with submerged rocks especially inshore of rock. Stay 1/2 a mile out from shore. We never managed to dive this site because of the big swell. The SS Kalliopi S. has an uncertain history – please see the references below for more information. It was either torpedoed or aerially bombed during the early years of World War II depending on your information. Diving the northen side (below the light house), it drops off from very shallow to18 metres in low water. Sandy bottom on the eastern side. Best to dive on slack; if not, the eastern side is best to dive on an outgoing tide (1.5 knot ebbing current). But can be dived a few hours after MBB high water. The western side is best to dive on an incoming tide. Approach the island from the centre of the channel: do not take direct line to the island as it is very shallow (with a shallow wreck in the direct path). We haven’t dived this site yet. Dive off the most south-westerly tip for the best drop off to 20m. The open western side slopes off more gently. The northern most point and southern most point shelve to 6m and 5m respectively. Drop to the north in a filling tide and to the south in an ebbing tide. Sandy bottom on this site and again, yet to do it. Another possible site is Milestone Bay but there was a fish farm there in October 08. The best slip to use to get to sites in Broad Water is the slip at the Woodquarter picnic area, two minutes south of Cranford. There are many fish farms, shoals and submerged rocks so take care when navigating and be prepared for new fish farms appearing on your planned dive site! We dived Pan Bay just south of the third Narrows in Mulroy Bay. It was a lovely dive with a bit of depth (35m) and tonnes of life. We saw a dog-fish nursery: 30+ dogfish on one dive with baby dogfish all over the place. There were loads of scallops as well as tiny spider crabs, little jellyfish and pipefish. The bottom is a little muddy but a layer of coral-type material meant it didn’t stir up too much. It didn’t appear to be too tidal. Two ocean diver sites on the west side of Broadwater Bay. Campbell’s Bed has a little more depth reaching 30m at the southern edge. Both sites have muddy bottoms and required care when approached by boat with many isolated danger marks and marine farms in the vicinity. More information in the Underwater Ireland book, which bills Campbells Bed as an excellent night dive. Many of the sites in North Water make good shore dives. If diving from a boat, either Mevagh Boat Yard slip or the slip at the Woodquarter picnic area (two mins south of Cranford) would both be ok, if somewhat of a long drive. Just south of Agharooney point in Massmount Bay there is a gated track leading down to the shore. The easiest point of shore entry is just to the left as you walk down to the site, you will notice a rope line entering the water and this provides a handy reference for entry and exit. Its a fantastic wee site with a band on small boulders and rocks running from 5m down to 15m. After 15m it gets quite dark but keeps dropping to 20m and beyond. The seabed is silty at this point and again this is where you find the rays. The site at Lagmore bay is probably better for seeing the rays as they come right into the shallows as the seabed is silty all the way to the shore however the band of rocks in Massmount probably make it a better site overall. There is a large variety of life in amongst the rocks, more than any other site we dived in October ’08. We found a huge amount of blennies or gobies of some sort and a large banded pipefish. The visibility was very good and could be an excellent site for photography. Highly recommended for all divers of grade Novice and above. You can actually launch a boat there – we seen it being done but probably not recomended unless you are the best of offroad drivers or the owner of a tractor. There is parking for 4 cars at a layby on the other side of the road opposite the gate. To drive to the site for a shore dive, head for Tamney (Tawney) for Massmount, pass church on left and the dive site/reef is just up from the Church. A deep shore dive (50 metres +) accessible from Agharooney Point as well. The swim out is quite far though: approximately 15 minutes from shore before you would reach significant depth. We haven’t dived here yet. Only a short distance north along the road from Massmount Bay there is a layby with space for 6 vehicles to park with care overlooking a stoney beach. Shore entry and exit is reasonably tricky due to the presence of large rocks and small boulders just below the surface. The site is very silty and barren however there are many opportunities to spot rays at depths between 5m and 15m. The site doesn’t get much deeper than this. There is a small risk of entanglement with abandoned fishing gear on the seabed so take some sort of cutters just in case. At the entrance to Massmount Bay and north of the third Narrows lies the Moross Channel. Apparently it can be dived as a drift dive, dropping divers in either side of Ross point/Moross Point, but we’ve yet to try it. The tides in Mulroy Bay can be fast and unpredictable. Around Knox’s Hole south of the First Narrows, divers swirled in eddies while others were spat up the channel. Boat handlers should be on the ready for divers travelling significant distances and divers should always deploy delayed SMBs if they find themselves in a current. Working VHFs and rescue sausages are essential. Important note to boat coxswains: When diving any sites in Mulroy Bay north or south of Mevagh Boat Yard, extreme care is advised. Take laminated copies of the appropriate sections of the chart and be on the look out for shoals and sand bars. The area gets very shallow in many places. Sheephaven Sub-Aqua Club may also provide air fills. Mevagh does nitrox. We stayed in the wonderful Downings Coastguard cottages about five minutes drive from Downings. They are comfortable self-catering holiday cottages with nice hot showers and there are lots of them which means you can take a big trip up here. Each cottages sleeps 7, linen and towels were provided and electricity costs were separate. The only downsides are that there is no pub within walking distance and, as is often the case, there were more double beds than couples on the trip so some people ended up sharing. The cottages are a hop skip and a jump from both Downings and Mevagh Boat Yard slips. If you were seriously considering a lot of diving in Massmount or Broadwater you would probably be better off finding accommodation a little closer – or half way between – as the Massmount shore dive was 45 minutes drive from the cottages. Still being able to house everybody in one spot is a big plus. Carrigart has plenty in the way of pubs and restaurants and there’s also a supermarket with ATM. For a large trip, the Mevagh Hotel is good for food although slightly over a student budget. The Singing Pub, 2 miles north of Mevagh Boat Yard, is supposed to be nice and we enjoyed the Harbour Bar in Downings. Finally there’s also a large petrol station at the start of the R245, the Ramelton Road just short of Letterkenny. Head for Ardee, either by going out along the N2, or else by heading up the M1 and cutting across via the N33. The M1 route is probably quicker. Follow the N2 through Castleblaney and Monaghan to the border where it becomes the A5. Follow the A5 through Omagh and Strabane and then cross the border again into Lifford. Take the N14 to Letterkenny and then either go the main N56 road to Creeslough and then the R245 to Carrigart or else take the R245 just before you enter Letterkenny and follow this through Ramelton, Millford and Cranford before arriving in Carrigart. The second route avoids rush-hour traffic in Letterkenny. Follow signs for Downings in Carrigart. The journey should take between four and four and a half hours (assuming no traffic jams).